Florida never seemed to be a top target for Republicans in the 2018 Senate map, but it’s looking better by the day. 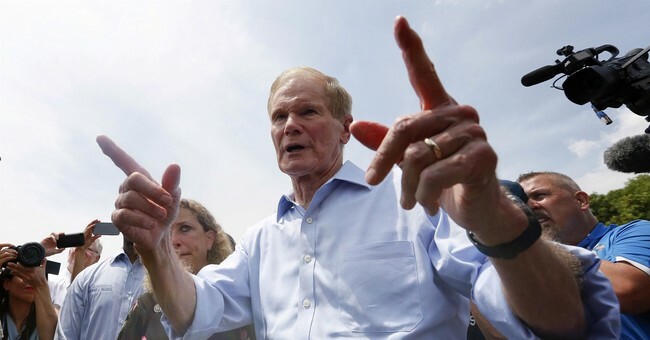 For starters, three-term incumbent Democratic Sen. Bill Nelson is only known statewide by 49 percent of Florida voters, a very weak showing. He’s also facing a strong candidate in Republican Gov. Rick Scott, who is term-limited and tossed his hat into the 2018 ring. Scott is independently wealthy. He will be able to partially finance his own campaign, as he’s done in the past. He’s currently outworking Nelson and killing the Florida Democrat on Hispanic outreach. Gov. Scott is also beating Nelson with older voters, who are reliable voters come Election Day. It’s not like this was a shock to Nelson. He came to Sen. Chuck Schumer’s (D-NY) office last fall laying out the massive financial undertaking he would need to execute in order to win re-election. The man needs money and he appears to be stuck in neutral on all fronts, making Democrats very worried. Nelson also will certainly try to make gun control an issue; a fatal flaw given that it will only further energize the conservative Republican base in the state. If young voters somewhat energized by the anti-gun activism of the survivors of the Marjory Stoneman Douglas High School shooting in February, then it would be a different story. So far, the needle hasn’t moved with that demographic. Gov. Scott, much to Second Amendment supporters’ ire, signed an appalling anti-gun bill into law that increased the age to purchase any firearm to 21. It’s grossly unconstitutional. But, in the end, of course, Scott is the better option. …the Tampa Bay Times went to Pasco County, and the indication they got was that support for Republicans was "as strong as ever." "The Tampa Bay Times conducted dozens of interviews with voters in this west Pasco enclave that show support for President Donald J. Trump is as strong as ever," found reporters Adam Smith and Langston Taylor. The reporters found voters in Pasco County, which swung toward Trump more dramatically than any other county in Florida, to be pleased with Trump and angry at the onslaught of negativity directed at him by the media and Democrats. "Based on dozens of random interviews this month with voters, the widely expected ‘blue wave' of anti-Trump voters carrying Democrats to victory in November is dubious at best," they wrote. "In interview after interview, voters dismissed the constant drama and controversy surrounding Trump," they wrote. "They sense that the president is getting a lot done, and see the economy improving." The interviews show voters, many of them Democrats, are passionately behind Trump, who has aligned himself with Nelson's Republican opponent in November, Florida governor Rick Scott. "I'm sick of everybody trying to knock him down. Trump's doing a good job," said Joe Vellucci, an Obama voter who is now a Republican. "He's done just what he said he was going to do." Victor Berrios, another Obama voter, is still a registered Democrat, but now says his party needs to "lighten up a little bit" and "let the man run the country." Well, we said Nelson was in deep trouble—and he looks like he’ll remain in that state of vulnerability.